Posted in News on November 19, 2015 by Zac Flamig. Race Clark and his GIS day poster. 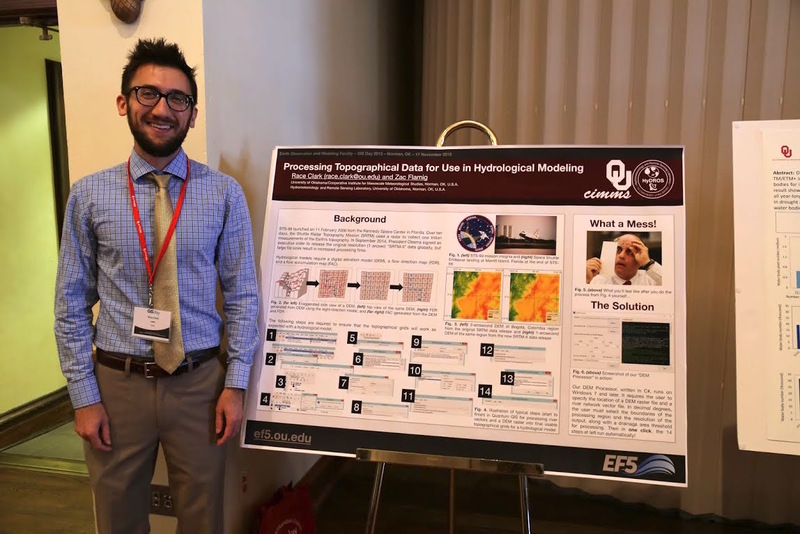 Graduate student and PhD candidate Race Clark (OU/CIMMS) won 3rd place at the 2015 OU GIS Day poster contest held November 17, 2015 in Norman, OK. His poster was titled “Processing Topographical Data for Hydrological Modeling”, which presented a new software tool for speeding up topographical preprocessing for hydrological models. This software tool is primarily designed for use during international capacity building workshops. 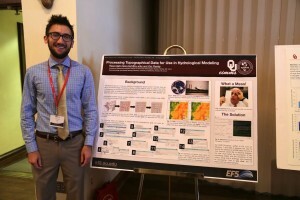 His coauthor on the poster is fellow graduate student and PhD candidate Zac Flamig (OU/CIMMS). Both students are advised by Drs. J.J. Gourley (NOAA/NSSL) and Yang Hong (OU Civil and Environmental Engineering).